Directions How to use: 1. Remove strip from pouch. Twist strip to loosen and separate slits prior to use. 2. After washing your face, thoroughly wet your nose. The strip won't stick on a dry nose. 3. Dry hands. Peel strip off plastic liner. Apply to nose area, smooth side down, pressing down to ensure good contact with skin. 4. Let dry for about 10-15 minutes until stiff to the touch - like papier-mâché. 5. Slowly and carefully peel off starting at edges, pulling toward center. Uses Triumph over defiant blackheads. 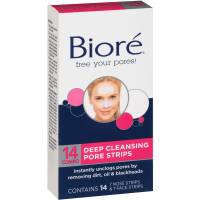 Bioré ultra deep cleansing pore strips offer maximum pore cleansing power to combat headstrong pore-clogging dirt and oil around the nose area. Formulated with tea tree oil, menthol and witch hazel, you can feel the strips working as they deep clean, refresh and purify pores. 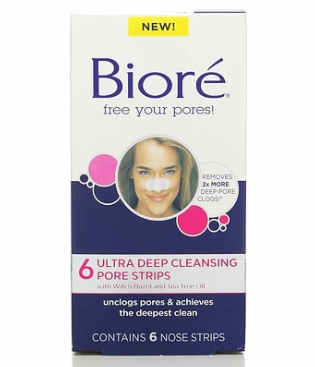 In just one use, Bioré ultra deep cleansing pore strips are twice as effective as the leading pore cleanser at getting rid of blackheads. 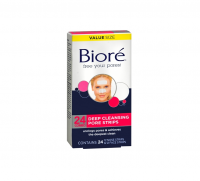 When used regularly, Bioré ultra deep cleansing pore strips actually diminish the appearance of pores. Bioré nose strips have an innovative slit design for improved fit. Do not use more often than once every three days. Dermatologist tested, hypo-allergenic. Warnings 1. Use only on the nose. 2. Avoid using on acne blemishes or swollen, sunburned, excessively dry skin, or skin prone to spider veins. 3. 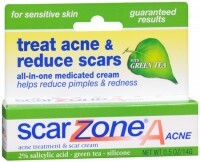 Consult physician before using on skin being treated with prescription acne medication. 4. Avoid using on skin which is sensitive to bandages or peel-off face masks. 5. Remove strip as directed promptly after it becomes stiff. If strip is difficult or painful to remove, wet strip thoroughly until it slides off easily. Forceful removal of the strip should be avoided and may cause skin abrasions. If this occurs, discontinue use and consult a physician. 6. Do not use more often than once every three days.